I have submitted a piece to a journal about Japan and its recent investment in amphibious capability, arguing that this is a way for the Army to continue to get funding but not a good thing for Japan’s security (see this draft presented at the EISA). I am not sure whether I see the carriers in the same light, but am tempted to do so. That the Navy might want them because it would be good for the Navy’s image, autonomy, budgets, etc–basic bureaucratic politics. But how does it fit into Japan’s grand strategy? Given where Japan sits–close to Korea and within range of China’s missiles and all that, what good would the carriers do AND what are the tradeoffs and consequences? First, the latter: the helo carriers were anti-submarine platforms. Japan had a nice division of labor, given the restriction on offensive capability (Article 9 of its Constitution has been reinterepreted but not revised), where the Maritime Self-Defence Force could protect the US ships that would be doing the striking. So, if Japan puts a bunch of planes on the carriers, this means fewer helos on these ships–space is finite. Second, like the amphibious forces, the development of aircraft carriers scares the neighborhood since the last time Japan had carriers, well, things did not go well for the neighbors. Sure, that is 80 years ago or so, but memories of WWII have been kept alive and shape perceptions far more in East Asia than in Europe. So, there are some consequences for having carriers–it is not a cost free thing. Japan’s defense budget is relatively fixed at 1% of GDP, and Japan’s economy has been stagnating more or less for a couple of decades. Ok, what can F35-bearing carriers do for Japan? Um….. Not sure. Japan can reach Korea and the seas off of Japan with land based ships. They can build more air bases on their chain of islands that reach down a far way. 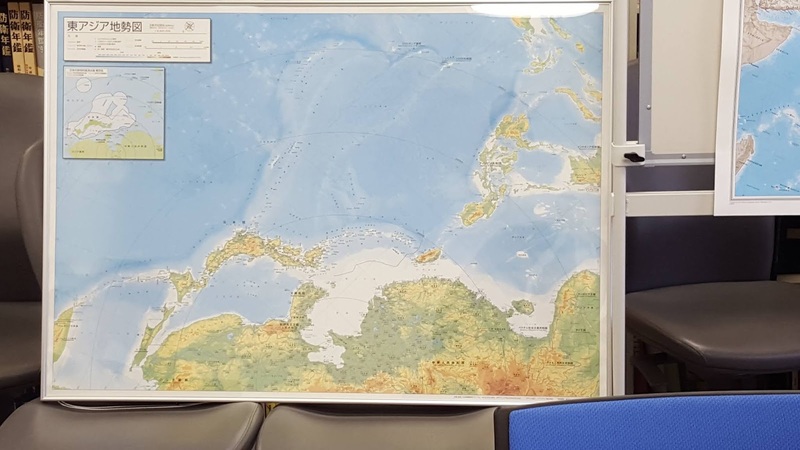 See the typical Japanese map of the region makes it clear that Japan’s islands contain China–maybe the better investment is in anti-air and anti-ship missiles? Would it make sense to send these carriers to the South China Sea? Um, only if the Japanese want them sunk in a time of war. The US is already pondering whether its carriers could survive there, and they have a wee bit more capability in both directions–to attack and to defend. Where else can these carriers go? Pearl Harbor? Oops. Again, the basic question is whether the plan to modify these ships and buy F35Bs fit into Japan’s larger grand strategy–what is the master plan for defending itself and where do the carriers fit in? There may be good answers to this, but I don’t know if any one is asking or answering these questions. I do know from my interview work in Japan over the past few years that it is unlikely that anyone in the Diet (Japan’s parliament) is asking these questions, that the Ministry of Defense is far more focused on protecting the Self-Defense Forces from scrutiny, that the Minister of Defense is rarely around long enough to know much about the SDF, and that the only actor who has the access and power to shape the SDF is usually too busy to spend much attention–the Prime Minister. The media? Tends not to ask difficult questions. Think tanks? Not quite the same vibrant think tank culture in Japan on defense issues as in the US, UK or even Australia.